This product is featured in: Haines 26: Entry-level model to launch in May. This is where you get a glimpse of what is so special about having your boat built by an outfit like Haines. The customer has their say from the very moment the dotted line is signed and there is scope to properly make your mark on the boat. The 32 is handmade, so if you want something done slightly differently from the previous boat out of the shed you can do. And, of course, with handmade craftsmanship comes a level of quality and attention to detail usually reserved for boats twice this size. It is a wonderfully well put together piece of kit, bursting with sublime woodwork, top notch components and pure clever boat building like thick fiddled edges, plenty of handholds and interior panels that simply unscrew so that you can easily get access behind the scenes if work needs to be done. 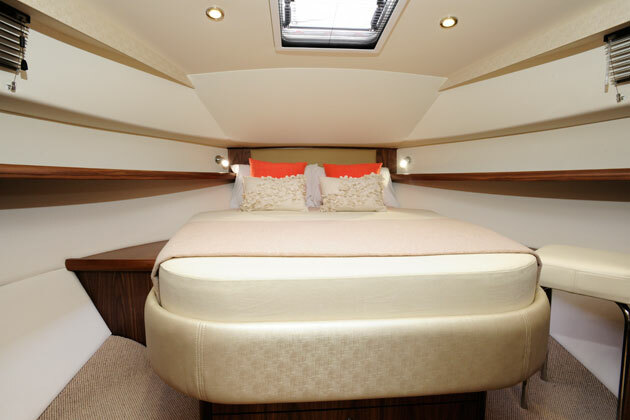 The standard layout comprises a double cabin forward with a bathroom to port and U-shaped galley to starboard. But you can have a bunk bed cabin in place of the galley if so desired and in this instance the galley moves up the saloon. 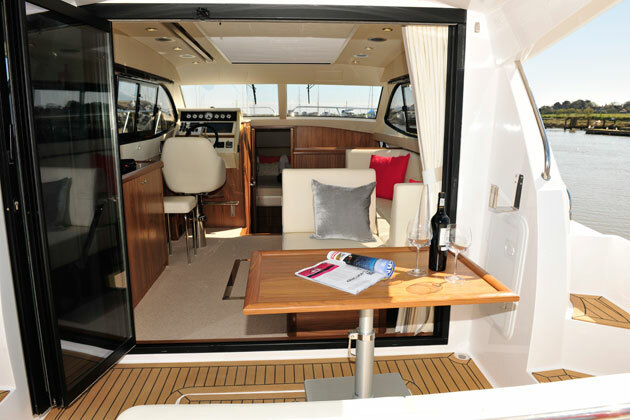 Thanks to fantastic doors that Haines have sourced from Germany, which split to individual panels and fold flush against the sides of the wheelhouse, the saloon and cockpit can be transformed into one large living space. A manual sliding sunroof in the saloon and retracting sunshade over the cockpit blur the lines even further between inside and outside to make the 32 a genuine year round, turn-key-and-go option. You can read the full review of the Haines 32 Offshore in the August 2015 issue of Motor Boat & Yachting, out 2 July. The Haines 32 Offshore gives you the sort of high quality finish and control over design usually reserved for people buying boats with a seven figure price tag. Mix in a confident hull and good choice of engine options and you have a very desirable package, especially for a couple.